Travelwheels Campervan Hire Sydney is located in the Botany area of Sydney at 1084 Botany Road, Botany, Sydney, New South Wales, 2019. 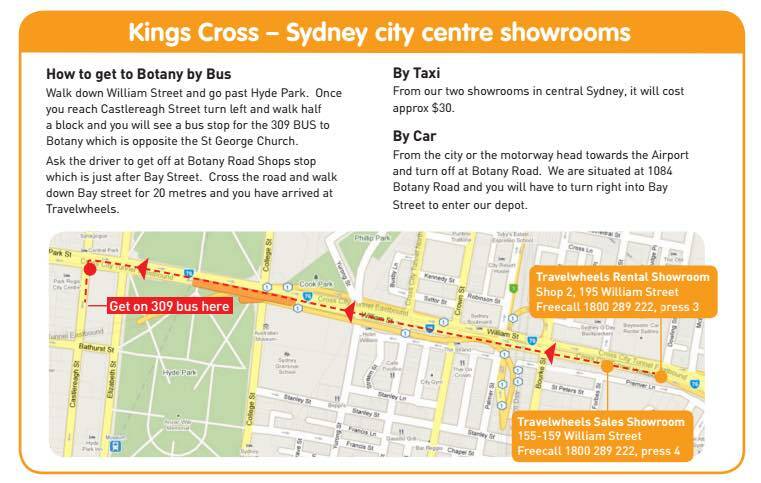 Driving Directions to travelwheels campervan hire Sydney depot. Travelwheels is located at 1084 Botany Road. If you are driving from the city, or coming from Melbourne or Brisbane then you need to follow the signs for Sydney Domestic Airport. Once you get close to Sydney’s Domestic Airport, you need to turn off at Botany Road (not heading towards the city!). We are less than a ten minute drive away from Sydney domestic Airport. If you have a GPS or smartphone, then our address is 1084, Botany Road, Botany, Sydney, NSW, 2019. If you get lost, then you can call travelwheels on 0412766616 and ask for some directions! Once you are on Botany Road, then watch out for the Waterworks pub which will be on your right hand side by Bay Street. As soon as you see the waterworks pub on your right hand side, then turn into Bay Street. Once you turn into Bay Street there is a little lane on the right hand side about 10 metres from Bay Street. Turn right and you have found us! Very easy to get back to the city from Travelwheels Campervan Hire Sydney Depot. 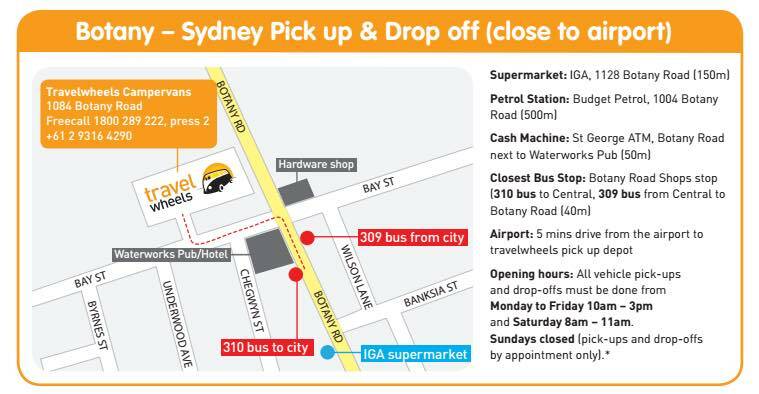 It’s a 50 metre walk back to the Waterworks Hotel and you can catch a direct bus back to Sydney city centre for $4. 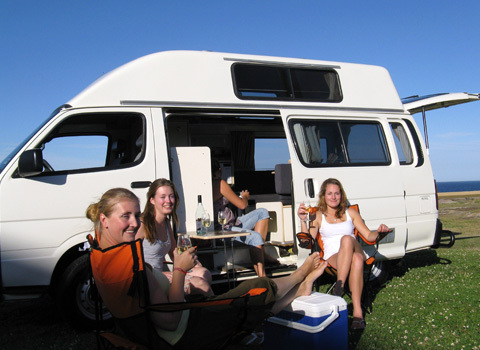 Travelwheels Campervan Hire Sydney depot is conveniently located near the airport. Its very easy to book a travelwheels campervan from our office in city centre or get a quick campervan hire quote online here. Once you have booked your campervan from our friendly staff, it’s cheap and easy to get to our base in Botany. All you have to do is take cheap public transport to travelwheels campervan hire Sydney pick up and drop off depot and it will only cost $4 per person on the bus. Next to our hire depot we have a lots of local shops and facilities so that you can stock up your camper without wasting time. This way you can be ready to hit the road and start your Australian Adventure. Domestic Airport Railway Station (2.3km) – note we suggest getting the bus as it is easier than the train from Sydney city centre. Travelwheels Campervan Hire Sydney has a range of local shops nearby and there are also two bakeries, chemists, newsagents, two pubs, restaurants, coffee shops all within 100m of our campervan hire depot to make your trip more comfortable. Travelwheels Sydney campervan hire has a depot that is conveniently located close to the Airport. With our campervan hire specials you can fly in to either domestic or international airport and within one hour of picking up your bags you can be in your camper starting your holiday! Used car and campervans for sale in Sydney with Travelwheels used car sales.